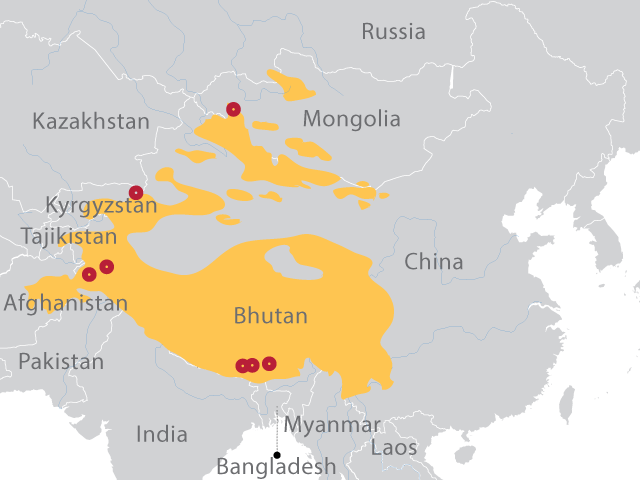 Millions of people depend on water that springs from the high-mountain headwaters of Central Asia. Its towering peaks are home to the endangered snow leopard, ancient cultures, and landscapes that are being too quickly transformed by climate change. Glaciers are melting, snow cover and permafrost are disappearing, and water availability is changing—putting local and downstream communities and ecosystems at risk. In October 2012, WWF began to address this through the USAID-funded Conservation and Adaptation in Asia's High Mountain Landscapes and Communities Project. The five-year effort promotes a transboundary approach to climate-smart management of high mountain landscapes and enhanced water security throughout the snow leopard range. "The retreat of glaciers due to climate change is a very serious, but little-known, threat for Asia's water security, people's livelihoods, and mountain biodiversity," says Mary Melnyk, Environmental Security and Resilience Team Leader for USAID's Asia Bureau. "To address this threat, our goal for this project is to maintain high mountain headwater areas through conserving critical ecosystems that include snow leopard habitat, and assisting local communities as they adapt to climate-driven changes to their water supplies." This interconnected climate-water-wildlife approach is novel, and it is the first time comprehensive, coordinated, climate-smart conservation is being implemented across the vast range of snow leopard habitat instead of in isolated project sites. "Ten years ago, this grass was so high it was hard to drive a car through," says Omurbeck Kurmanaliev, gesturing across a flat, exposed valley lying between umber foothills. A small brook courses through the middle, runoff from the steep flank of a mountainside dusted with late spring snow. Alongside the water, a low mat of grass carpets the rocky soil—an oasis at which a small herd of bony cows munches away. A Kyrgyz boy on the main road in the small, high-mountain village of Ak-Shyrak, a WWF project site. In front of a panel of judges—which included WWF staff members and an official from the Kyrgyz state environmental agency—teams representing the three mountain villages competed against each other, American Idol-style. With songs, skits, and original dances, they promoted environmental stewardship. There were women in blue chiffon dresses who played the part of water ("I was a pretty spring once, before people threw trash in me…"), and the Ak-Shyrak girls in snow leopard outfits brought down the house with a dance number set to a thumping beat. Farida Balbakova was delighted. "I feel like I awoke something that was sleeping inside of them," she says. Herding yaks, such as those in this demonstration herd, is being promoted as part of a suite of climate-adaptation strategies for high-altitude communities. Now, conservation groups like the Snow Leopard Trust and WWF are contributing scientific research and community education, helping local women earn extra income through handicrafts and snow leopard tourism programs, and advising villagers on methods for protecting livestock. And Kyrgyz government agencies and nonprofits have started working together with INTERPOL on a national antipoaching program that trains, publicly honors, and financially rewards park rangers and community members who successfully apprehend wildlife poachers. Environmental education projects in Kyrgyzstan’s high mountain communities are fostering a new generation of conservation stewards.